Sheep casings come packed in salt brine. 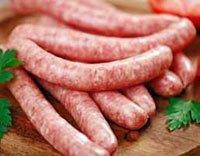 They vary in type from pork sausage quality to hot dog quality. They also can be resalted and stored under refrigeration. Sheep casings are edible and have 2 different types. Hot dog quality sheep casings have no holes and are used only when the meat is emulsified or vacuum chopped. All other sheep casing is used for link sausage to snack sticks depending on the diameter desired. Size varies from 19mm to 26mm and a hank will stuff from 40 to 65 pounds of meat depending on the diameter. Each hank is approximately 100 yards. SOAK FOR 15 MINUTES IN LUKE WARM WATER.